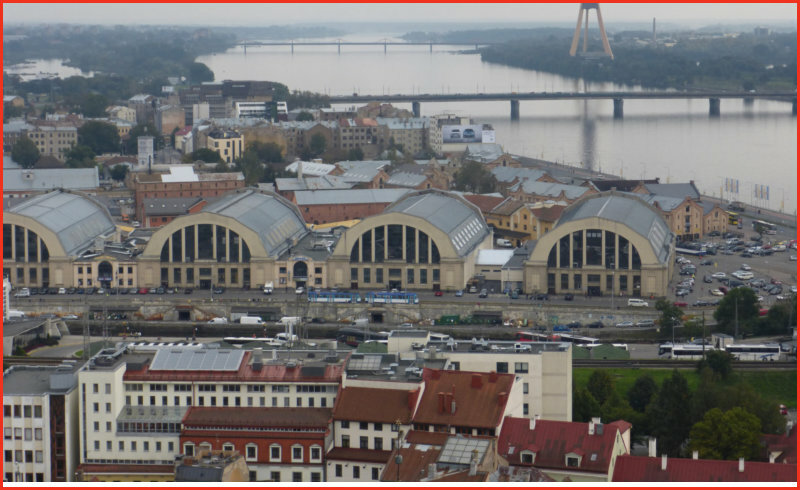 Riga is situated at the mouth of the Daugava, on the shores of the Gulf of Riga on the Baltic. It has an ancient history and rich cultural heritage with much diverse architecture. Riga has been named a UNESCO World Heritage Site thanks to the collection of art nouveau buildings that is one of the largest in the world, as well as a city in whose architecture the entire history from 1201 to the present day is reflected. 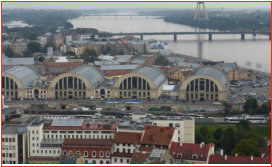 It is also valued as a city with a unique collection of wooden developments in its central section. 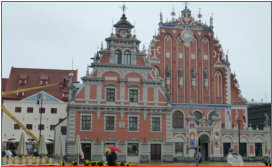 Riga has traditionally served as a crossroads for trade and business between east and west. 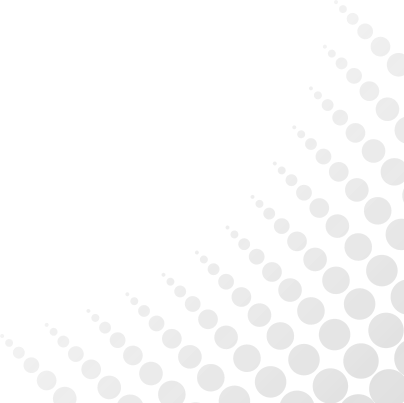 In 1282 it became a member of the Hanseatic League and remained an active member until its disintegration some 300 years later. Morning walking tour passing the Freedom Monument and National Opera House to the Old Town. 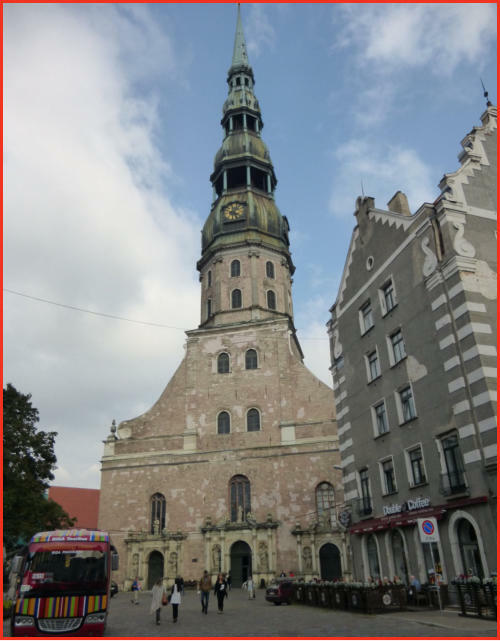 Walked along cobbled streets passed colourfully restored merchant’s residences, old town squares with numerous cafes and historical monuments such as the Dome Cathedral, St. Peter’s Church, the Powder Tower, the House of Blackheads and Riga St Jacobs Cathedral. There are many architectural masterpieces of the early 20th century Art Nouveau period en route. Visited the market and Roman Orthadox church before going to the 27th floor of the Radisson Blu to see the view. 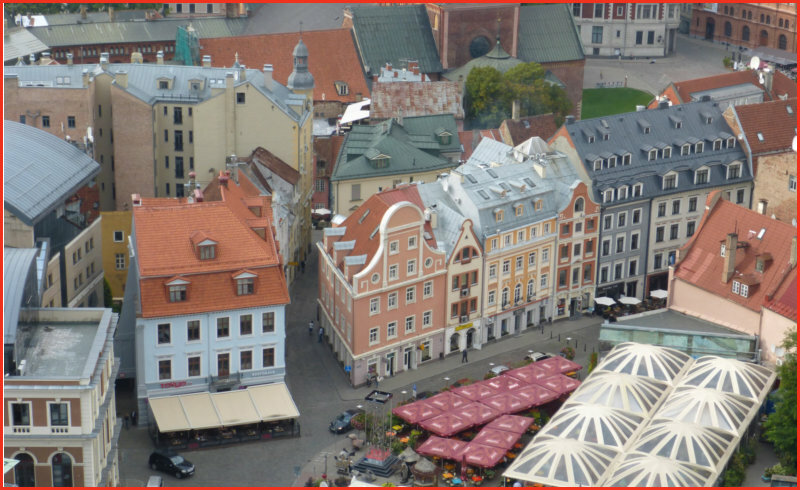 In the heart of Old Riga this is the largest square and its current appearance goes back to the 1930s when only a portion of its medieval buildings were torn down. On the edge of the square one can see the Dome Cathedral. Dome Cathedral was built as Bishop Albert’s Cathedral in 1211 and rebuilt several times since, so today exhibits a mixture of late Romanesque, early Gothic and Baroque architectural styles. 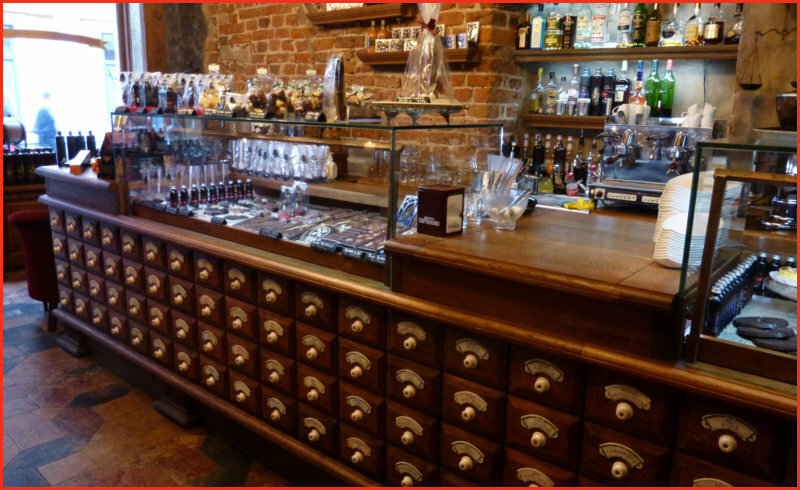 Over many centuries the building has changed landlords and undergone many transformations. Since 1923 it has belonged to the Roman Catholic Church. The cathedral is famous for its organ, built between 1883 and 1884 and boasting 124 registers and 6828 pipes, it is used in many concerts and recitals. >The Freedom Monument This is both a symbol of the Latvian independence and Riga’s major landmark. Its three stars rise above the trees of the central parks. 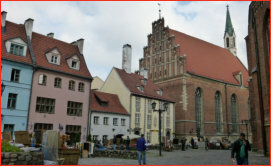 In the Middle Ages it served as an open air market. 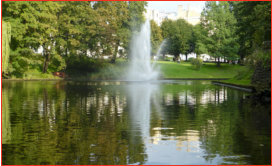 During World War II the square was completely destroyed. 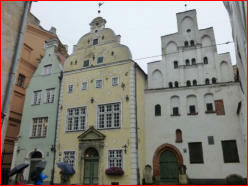 However, the town hall has been completely restored as have the Blackheads and Schwabe’s House, and the statue of Roland. Also on this square is the 1970s Soviet Era building that houses the Occupation Museum. >The House of Blackheads Built in 14th century, it belonged to the Guild of Unmarried Merchants. At the time it was the richest and most prestigious venue in the whole city. It was severely damaged and pillaged during WWII, but was rebuilt again in 1999 as an exact copy of the original with a magnificent Dutch Renaissance facade and amazing ceiling paintings inside. Three Brothers is a charming group of residential houses each from a different century, the oldest dating back to the 15th century. 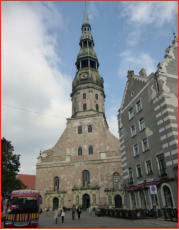 >The Powder Tower The Powder Tower is one of Riga’s fortification towers and was originally called the Sand Tower. It dates back to 1330. Rebuilt numerous times, it gained its current name in the 17th century when they began to store gunpowder in the tower. Since 1919 it houses the Latvian War Museum. One of the most striking features of the Old Town’s classic skyline is the Riga Castle, which has served as the seat of various rulers throughout the centuries. After independence was restored in 1991, the castle became the primary workplace of the President of Latvia. 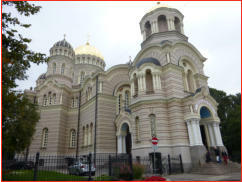 The biggest Orthodox church in Riga, having served as a planetarium and a restaurant during the Soviet era it has now been restored as a church. Livu Square is relatively new, built in the middle of the 20th century after World War II. 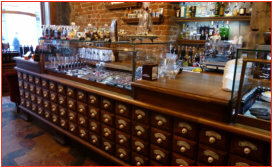 An interesting complex of 18th century residential buildings has been preserved here, as well as, the 18th century built Large Guild (merchant association) and Small Guild (craftsmen’s association) buildings in which one can see richly decorated interiors. 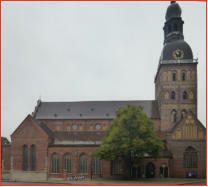 St Peter’s Church is an imposing red brick church, first built from timber in 1209, then rebuilt in stone. St. Peter's was a Catholic church until 1523, when it turned Lutheran. Its wooden tower, the highest in Europe at that time, was destroyed several times. It first collapsed in 1666 and was rebuilt a year later. To see how long it would last, the builders hurled a glass from the top: the more pieces the vessel broke into, the greater the tower's longevity. Alas, a pile of straw cushioned the glass' fall and the spire burnt down one year later. Artillery fire destroyed the structure again in 1941. In 1973 it was finally rebuilt and the glass ritual was repeated, this time with smashing results. Visitors can take the lift to the observation platform for spectacular views of the city. >The Central Market The Central Market is one of the largest and oldest markets in Europe with five food pavilions located inside vast converted Zeppellin hangars. In stalls around and between them, everything from clothes to flowers is sold. It’s always bustling and a great place to observe local people, try local produce and buy some bargains. 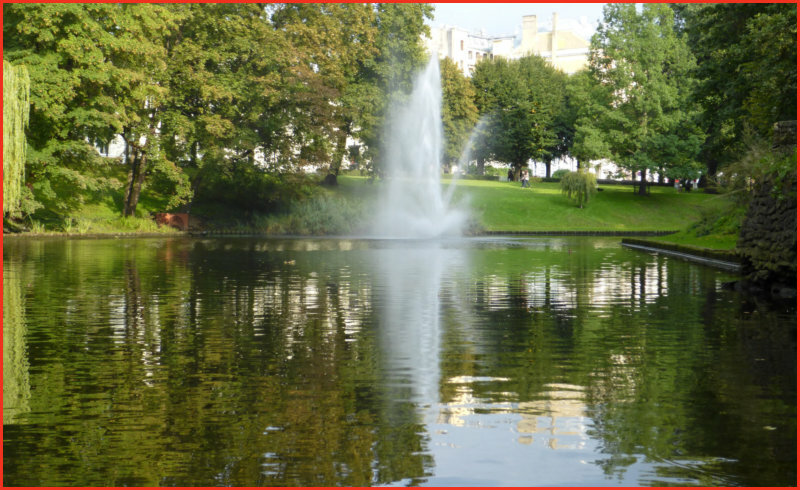 >Canal and River Cruise A leisurely boat tour of the River Daugava and Riga canal is really interesting but unfortunately this is only possible from April - October as both waterways usually freeze over in winter. 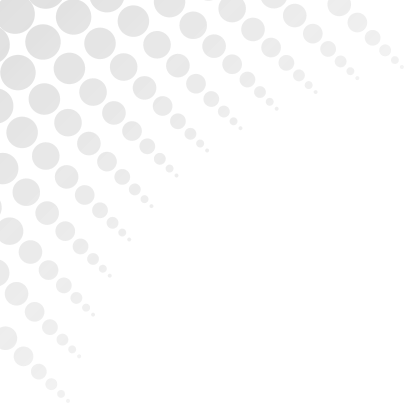 >Black Balsam Riga Black balsam is a dark and astringent liqueur made of 24 herbs; the recipe remains unchanged for 250 years. 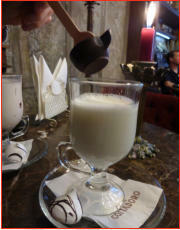 The balsam is good when drinking alone or as part of hot drinks and cocktails and especially with chocolate products. Take a visit to the Black Magic Bar and have a cup of hot chocolate!